Please see the Solar Buying Guide - Step 3 for an explanation of where and how you can use PV Watts successfully. It's a great tool for predicting how much energy a PV system of a given size will produce in a year, placed on a given roof in a given location. As such, it seems the tool of choice to double-check the often questionable predictions of annual energy found on a solar quote. The trouble with PV Watts is that the resulting estimate is likely to be way off because of its input #7 below: System Losses. Because annual energy production correlates so poorly with DC system size for nearly all solar panels, the PV Watts must be calibrated to each different brand and model of panel in order to be accurate. This calibration can most easily be done via the value entered for the System Losses variable (#7). 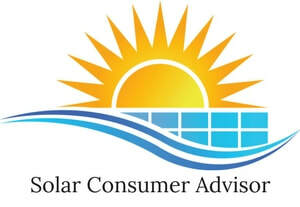 Solar Consumer Advisor has so far carefully calibrated PV Watts for the best quality panels, but it is impractical to do this for the huge number of other panels being sold. Again, please see the Buying Guide for the full story about panels and PV Watts. Click on a weather station near you whose weather is most like yours. DC System Size: Enter the STC power rating in kW to 3 decimal places. Array Type: Select "Fixed (roof mount)." System Losses (the key input): enter the appropriate figures from the Solar Buying Guide - Step 3 for the panels you've chosen. Click on the + sign to the left of "Advanced Parameters." DC to AC size ratio: Divide the DC System Size in #3 above by the AC output rating of your inverter, often called "AC nominal power." For example, if you have a 4.000 kW STC rated system and 3.630 kW AC output inverter (maybe specified as 3,630 watts), your DC to AC size ratio is 4.000/3.630 = 1.1. Inverter Efficiency: Enter the CEC efficiency of your inverter to 1 decimal place. Initial Economics: leave blank. Not very good estimates anyway. GO TO PV WATTS RESULTS. You will see a total at the top of the results page in kWh/yr. This is an accurate estimate of how much electricity your system will produce on your roof in a year with average weather. Underneath the total is a range, showing the minimum and maximum you'll get iin worse and better years, based on the last 30 years of weather data. This estimate of kWh/yr should be close to the one in your quote. If they differ by more than a couple of percent, the dealer should recalculate. If still off, the dealer should look at your PV Watts printed results and explain the difference. Anyone can make a mistake. This is, after all, the crucial figure: the size of system you need in terms of annual energy produced. *If your panels are on multiple roof surfaces, input separate PV Watts info for each roof surface and add the resulting kWh/yr. for each to get your total system kWh/yr.